A precious metals IRA is a smart investment with numerous benefits for those who are planning ahead for retirement. ➜ What are the most frequently asked questions about a precious metals IRA? ➤ Call Birch Gold Group At (800)355-2116 or Fill Out The Form On This Page To Learn More. During the height of the Great Recession, many Americans watched their retirement accounts get eaten away by the declining values of stocks, mutual funds and bonds. Even the so-called “low-risk” funds weren’t completely safe from this volatility – and the effects were felt by millions of people. Today, more and more people are investing in precious metals, such as gold, silver, platinum and palladium. And by having those investments as part of an individual retirement account (IRA), you can provide a stronger safeguard for your savings, and potentially experience substantial growth as well. We all have different retirement goals and financial situations. Accordingly, we all must follow different paths to achieving those goals, depending on several factors that are unique to each person. Before you take the first step to preserving your wealth with a gold-backed IRA, you should take the time to do your research and understand your options. An experienced precious metals specialist can help you determine which investments are right for your specific goals and needs. Below, we’ve listed several frequently asked questions from investors like yourself. But when you’re ready to take the next step, be sure to have your questions answered by a professional who can provide personalized answers. What exactly is a precious metals IRA? A precious metals IRA is similar to a regular IRA (individual retirement account), except it is backed by investments in precious metals, as opposed to stocks or mutual funds. What types of investments can go in the IRA? Some of the most popular investment options include gold and silver bullion, proof gold and silver coins, and other precious metals, including platinum and palladium. Typically, having a mix of several different investments in your portfolio provides the greatest diversification and growth potential. ➔ Protection through diversification Investing in precious metals is a great way to diversify your portfolio, protecting it from the decline of other markets. This has become an especially important benefit to investors over the last several years as global economic uncertainty has made those markets even more volatile and risky. ➔ Growth potential Limited supplies and increasing demand for gold and silver have resulted in significant gains, and many expect the value of these resources to continue increasing well into the future. Also, the same economic instability that weakens stocks and other paper investments tends to increase the value of precious metals-backed IRAs. ➔ Hedge against inflation Precious metals tend to hold value above inflation for the simple reason that the Fed can’t simply make more gold on demand, like they do with paper currency. As such, having investments in gold and silver can help you maintain your purchasing power even as the dollar declines. ➔ Preservation of wealth Live tomorrow as you do today. That’s the essential goal of any investor who is planning for retirement, right? Precious metals can help you achieve this goal because of all the unique financial benefits listed above. I have another type of retirement account. Can I convert it? Yes. If you have a 401(k) with a previous employer, or an IRA, you can roll it over into a precious metals IRA. Is a gold-backed IRA approved by the government? Yes, the federal government has approved precious metals IRAs, so that individuals can enjoy some of the same benefits. In fact, some of the gold and silver coins minted by the government were specifically designed with retirement accounts in mind. At Birch Gold Group, we specialize in IRAs backed by gold and silver, and our consultants can help you decide which options are the perfect fit for your situation. 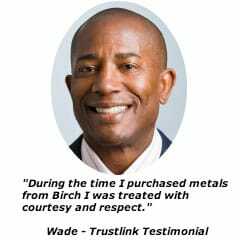 Rated A+ by the Better Business Bureau, Birch Gold Group is the precious metals company of choice for people who appreciate the personal touch and believe that integrity is still important. We strive to provide our clients with superior service at all times, and we are happy to educate you on all your options without high pressure sales tactics or obligation. Our company was founded upon moral and ethical principles. We are committed to helping you preserve your purchasing power and safeguard your retirement savings. We look forward to showing you how. 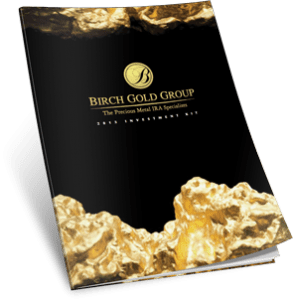 Call Birch Gold Group At (800)355-2116 or Fill Out The Form On This Page To Learn More.